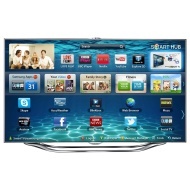 alaTest has collected and analyzed 182 reviews of Samsung UE40ES8000 Series. The average rating for this product is 4.5/5, compared to an average rating of 4.6/5 for other products in the same category for all reviews. People are impressed by the glare and durability. The design and image quality are also appreciated, but some have doubts about the size and remote control. We analyzed user and expert ratings, product age and more factors. Compared to other products in the same category the Samsung UE40ES8000 Series is awarded an overall alaScore™ of 89/100 = Very good quality. WHAT HI*FI? - SOUND AND VISION! the hand screen sensor can be a bit annoying at times. Sleek design and amazing quality. 'Source' selection on the remote control is confusing--it doesn't seem to remember the last choice.